It has been way too long since I have added anything to my inspiration file, but today I came across a space that I just had to share with you all! Decorate With a Little Bit created this gorgeous master bathroom. 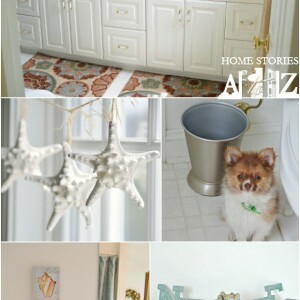 She explains in her post how she used an old window (won on ebay) to add architectural interest and brighten the space. Go visit her and say hi; she’s new to blogging! I love this! We’re looking for a stained glass window for our bathroom, too. Beth – – I saw this picture on Pinterest the other day and I pinned it!!! Great minds, eh? I love this idea and I love that she didn’t change the window – – she kept the old fixtures and everything. How beautiful is that?? Oh my! This is gorgeous!! Can’t wait to skip on over to this decorating genius’s blog 🙂 Thanks for featuring Beth!! I agree! Decorate with a Little Bit is amazing! Her ideas, photos and posts are so inspirational. Each post leaves my friends and I all abuzz with new ideas for our home projects – so glad that you found her too!